One Indian farmer commits suicide every half hour. Is climate change to blame? Since 2001, one Indian farmer has committed suicide every half hour. Is climate change to blame? Like most modernizing countries, India has seen a decline in the number of individuals who engage in agriculture for a living. 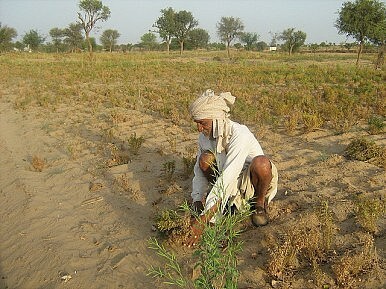 In the decade between 2001 and 2011, for example, the government estimates the number of Indian farmers declined by 9 million people, which marks the first absolute decline in this segment of the population since 1971. As a percentage of the total populace, farmers declined by 7 percent during the last decade, and they now constitute less than a quarter of India’s population. These numbers, in and of themselves, don’t necessarily constitute a bad trend. After all, a decline in the agrarian population could be a sign of increased productivity, or simply greater opportunities in the urban population. Yet one harrowing sign of the state of Indian farmers is the suicide rate. For decades Indian farmers have been committing suicide at alarming rates that are well above the rates of the population at large, which itself has been rising. Moreover, the problem does not appear to be getting any better; in fact, it is if anything worsening, despite the state’s efforts to address the problem. This was, the study’s author noted, if anything a drastic underestimation of the problem. That is because, according to the author, many police officers only counted someone who had committed suicide as a farmer if they owned the title to their land, which an increasing number of Indian farmers do not. Additionally, as in many cultures, many parts of India consider suicide taboo and therefore family members are likely to report the cause of death as something else. These numbers drew attention to the issue inside India, and various schemes were put in place to try to reverse the trend. Yet they appear to have had little to no success. According to the latest census, which was taken for 2011, nationwide, farmers committed suicide at a rate of 16.3 per 100,000 farmers. This was slightly higher than the 15.7 per 100,000 farmers who had committed suicide per 100,000 in 2001. Overall, official statistics show that since 2001, one Indian farmer has committed suicide every half hour. But the real shock comes when one compares the numbers to the Indian population at large, which has also experienced a rising suicide rate in recent years. For example, among the population writ large, an average of 11.1 Indians per 100,000 killed themselves in 2011. Thus, India’s farmers committed suicide at a rate 47 percent higher than the rest of the population. The problem has become so bad that some states stopped keeping track of the suicide rate among farmers. One of the interesting trends in India’s agricultural suicide rate is how concentrated it is among certain states in the country. Specifically, five states— Maharashtra, Andhra Pradesh, Karnataka, Madhya Pradesh and Chhattisgarh— account for a large (and growing) number of the suicides among farmers in the country. Overall, The Hindu notes, the “Big 5” accounted for just over half of the number of farmer suicides in 1995, but by 2011 the “Big 5” made-up over two-thirds of the suicides among farmers in India. Poverty and debt are likely a large part of the problem. As journalist Palagummi Sainath, who has long covered the issue, notes, four of these five states are in the cotton belt region of India, and the price of cotton in real terms is a twelfth of what it was thirty years ago. Furthermore, the government removed subsidies for cotton in 1997, around the time the suicide rate among farmers began becoming apparent. Interestingly, another likely culprit in the suicide phenomena is almost certainly climate change. Three of the “Big 5” are located along India’s coast, and like many Indian farmers, rely heavily on the monsoon each year for their crops. If a drought occurs they are left without a harvest that year, despite having spent enormous amounts of money on inputs like fertilizer and seeds. There’s anecdotal evidence to back this up. For example, The Huffington Post notes, “More than 17,368 Indian farmers reportedly killed themselves in 2009, the worst figure for farm suicides in six years and an increase of 1,172 from the previous year's figure.” Notably, there was also a huge drought in 2009.